Intestinal nematode infections affect one fourth to one third of the world's population. Of these, the intestinal roundworm Ascaris lumbricoides is the most common. While the vast majority of these cases are asymptomatic, infected persons may present with pulmonary or potentially severe gastrointestinal complaints. Ascariasis predominates in areas of poor sanitation and is associated with malnutrition, iron-deficiency anemia, and impairments of growth and cognition. Ascaris lumbricoides is shown in the image below. 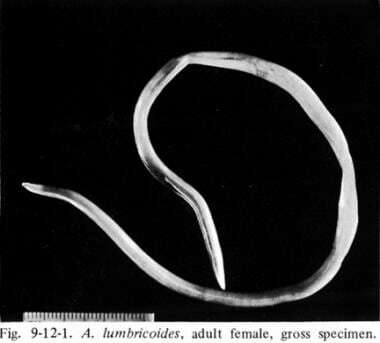 A lumbricoides is the largest of the intestinal nematodes affecting humans, measuring 15-35 cm in length in adulthood. Infection begins with the ingestion of embryonated (infective) eggs in feces-contaminated soil or foodstuffs. Once ingested, eggs hatch, usually in the small intestine, releasing small larvae that penetrate the intestinal wall. Larvae migrate to the pulmonary vascular beds and then to the alveoli via the portal veins usually 1-2 weeks after infection, during which time they may cause pulmonary symptoms (eg, cough, wheezing). During the time frame of pulmonary symptoms, eggs are not being shed, and thus diagnosis via stool ovas and parasites is not possible. Eggs are not shed in stool until roughly 40 days after the development of pulmonary symptoms. After migrating up the respiratory tract and being swallowed, they mature, copulate, and lay eggs in the intestines. Adult worms may live in the gut for 6-24 months, where they can cause partial or complete bowel obstruction in large numbers, or they can migrate into the appendix, hepatobiliary system, or pancreatic ducts and rarely other organs such as kidneys or brain. From egg ingestion to new egg passage takes approximately 9 weeks, with an additional 3 weeks needed for egg molting before they are capable of infecting a new host. Worldwide, 1.4 billion people are infected with A lumbricoides, with prevalence among developing countries as low as 4% in Mafia Island, Zanzibar,  to as high as 90% in some areas of Indonesia. Local practices (eg, termite mound–eating in Kenya  ) may predispose to ascariasis in some populations. Further risk factors include other forms of geophagia and cat/dog ownership. In some regions, Ascaris infection is thought to contribute significantly to the burden of abdominal surgical emergencies. Owing to similarities in the means of infection, many individuals infected with Ascaris are also co-infected with other intestinal parasites. Male children are thought to be infected more frequently, owing to a greater propensity to eat soil. Children, because of their habits (eg, directly or indirectly consuming soil), are more commonly and more heavily infected than adults. Neonates may be infected by transplacental infection. Frequently, families may be infected and reinfected in group fashion due to shared food and water sources as well as hygiene practices. The prognosis for ascariasis is excellent. However, in higher worm burden infections, serious complications such as obstruction are more common. Recommend good personal hygiene and food handling techniques: discriminate defecation, hand-washing, cleaning fruits and vegetables, and avoiding soil consumption. Educational programs should also address the use of human feces as fertilizer, a practice that persists in many communities internationally. Albonico M, Ramsan M, Wright V, et al. Soil-transmitted nematode infections and mebendazole treatment in Mafia Island schoolchildren. Ann Trop Med Parasitol. 2002 Oct. 96(7):717-26. [Medline]. Luoba AI, Wenzel Geissler P, Estambale B, et al. Earth-eating and reinfection with intestinal helminths among pregnant and lactating women in western Kenya. Trop Med Int Health. 2005 Mar. 10(3):220-7. [Medline]. Mishra PK, Agrawal A, Joshi M, Sanghvi B, Shah H, Parelkar SV. Intestinal obstruction in children due to Ascariasis: a tertiary health centre experience. Afr J Paediatr Surg. 2008 Jul-Dec. 5 (2):65-70. [Medline]. Haque M, Kamal F, Chowdhury S, Uzzaman M, Aziz I. Non Obstetric Causes and Presentation of Acute Abdomen among the Pregnant Women. J Family Reprod Health. 2014 Sep. 8 (3):117-22. [Medline]. Williams-Blangero S, Subedi J, Upadhayay RP, et al. Genetic analysis of susceptibility to infection with Ascaris lumbricoides. Am J Trop Med Hyg. 1999 Jun. 60(6):921-6. [Medline]. Mwanza JC. Lacrimal drainage obstruction by Ascaris lumbricoides. Bull Soc Belge Ophtalmol. 2004. 71-3. [Medline]. Karatepe O, Tukenmez M, Salmashogul A, et al. Ascaris as a leading point for small-bowel intussusception in an adult: a rare cause of intussusception. Am J Emerg Med. Mar 1 2008. 26(3):381.e3-381.e4. Jung O, Ditting T, Grone HJ, Geiger H, Hauser IA. Acute interstitial nephritis in a case of Ascaris lumbricoides infection. Nephrol Dial Transplant. 2004 Jun. 19(6):1625-8. [Medline]. Baralo B, Gurram S, Steckel J, Chulii M, Sharpilo A. Ascaris in the urinary tract: A case report and review of the literature. Urol Case Rep. 2018 Mar. 17:82-84. [Medline]. Selimoglu MA, Ozturk CF, Ertekin V. A rare manifestation of ascariasis: encephalopathy. J Emerg Med. 2005 Jan. 28(1):87-8. [Medline]. Lamberton PH, Jourdan PM. Human Ascariasis: Diagnostics Update. Curr Trop Med Rep. 2015. 2 (4):189-200. [Medline]. Pratt LT, Blachar A. Computed tomography diagnosis of intestinal ascariasis: incidental finding in a trauma patient. Isr Med Assoc J. 2007 Sep. 9 (9):688-9. [Medline]. Kessler DO, Gurwitz A, Tsung JW. Point-of-care sonographic detection of intestinal ascaris lumbricoides in the pediatric emergency department. Pediatr Emerg Care. 2010 Aug. 26(8):586-7. [Medline]. Ramareddy RS, Alladi A, Siddapa OS, Deepti V, Akthar T, Mamata B. Surgical complications of Ascaris lumbricoides in children. J Indian Assoc Pediatr Surg. 2012 Jul. 17 (3):116-9. [Medline]. Arya PK, Kukreti R, Arya M, Gupta SN. Magnetic resonace appearance of gall bladder ascariasis. Indian J Med Sci. 2005 May. 59(5):208-10. [Medline]. Sanai FM, Al-Karawi MA. Biliary ascariasis: report of a complicated case and literature review. Saudi J Gastroenterol. 2007 Jan-Mar. 13(1):25-32. [Medline]. Wickramasinghe DP, Samarasekera DN. Intestinal helminths detected in capsule endoscopy. Dig Endosc. 2012 Sep. 24 (5):388. [Medline]. Xiao SH, Hui-Ming W, Tanner M, Utzinger J, Chong W. Tribendimidine: a promising, safe and broad-spectrum anthelmintic agent from China. Acta Trop. 2005 Apr. 94(1):1-14. [Medline]. Bell DR. Soil transmitted helminths. Lecture Notes on Tropical Medicine. Boston: Blackwell Science; 1985. 167-192. Cappello M, Hotez PJ. Intestinal Nematodes. Philadelphia: Churchill-Livingstone; 2003. 1331-1333. Freedman DO. Intestinal nematodes. Gorbach, ed. Infectious Diseases. Philadelphia: WB Saunders; 1992. 2003-2008. Gilles HM. Intestinal nematode infections. GT Strickland, ed. Hunter's Tropical Medicine. Philadelphia: WB Saunders; 1984. 620-644. Liu LX, Weller PF. Antiparasitic drugs. N Engl J Med. 1996 May 2. 334(18):1178-84. [Medline]. Muennig P, Pallin D, Sell RL, Chan MS. The cost effectiveness of strategies for the treatment of intestinal parasites in immigrants. N Engl J Med. 1999 Mar 11. 340(10):773-9. [Medline]. Talaat KR, Nutman TB. Parasitic Diseases. Mason, ed. Murray & Nadel's Textbook of Respiratory Medicine. Philadelphia: Saunders; 2003. 1090-1092. Urbani C, Albonico M. Anthelminthic drug safety and drug administration in the control of soil-transmitted helminthiasis in community campaigns. Acta Trop. 2003 May. 86(2-3):215-21. [Medline]. Agrawal R, Mittal S, Jain M, Lamba GS. Severe acute pancreatitis caused by Ascaris lumbricoides. Trop Gastroenterol. 2012 Jul-Sep. 33 (3):235-6. [Medline]. Sotto Mayor J, Esperança S. IMAGES IN CLINICAL MEDICINE. Gastric Ascaris Infection. N Engl J Med. 2015 Oct 8. 373 (15):e18. [Medline]. 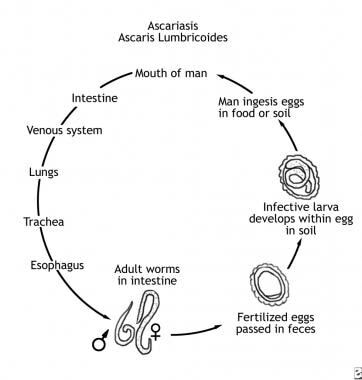 The roundworm Ascaris lumbricoides causes ascariasis. Worms can reach 10-30 cm in length. Clinical disease results from effects of pulmonary larval migration, intestinal obstruction, or migration through the biliary tree. Endoscopic retrograde cholangiogram shows long, linear, filling defect in common bile duct. Image courtesy of Medscape.com.